I think its safe to say that no one has any faith in Barack Obama as a leader … A Total and Epic Failure. Americans were told by Barack Obama and his minions that increasing the US debt ceiling was paramount to saving the US economy and stabilizing the economy. What say you Mr. President? Not only has the stock markets been down every day since the debt deal was signed by Obama, but yesterday the Dow Jones fell over 500. Thanks Barack. I guess those in DC who voted for this well labeled … sandwich, now see that many Americans hated this compromise. I wonder why? Now PJ Media asked the question … should Obama resign? A CEO with such a disastrous first three years as our president has had probably would already have been called upon to resign or been pushed out by his company’s board of directors — more than likely for some time. Obama has failed in virtually every direction, foreign and domestic. His policies indeed are almost non-existent. He is completely rudderless, unless you accept the view that he is following the prescription of Cloward-Piven and has set out to destroy American capitalism from within. If that is so — and I don’t really accept it for a variety of reasons — he has failed even at that, because his reelection becomes less likely with every passing day. A Cloward-Piven strategy could not be successful in only four years. America is far too strong for that. In the case of Obama, his policies are leading to something quite the opposite — an epic disaster for the Democratic Party and (modern) liberalism in 2012. What happened when the US markets caved in like an Obama cheap suit, or is it an empty one … the Asian and European markets followed. The Astute Blogger has three recommendations that could fix the terrible US and global economy. We especially like number 3. 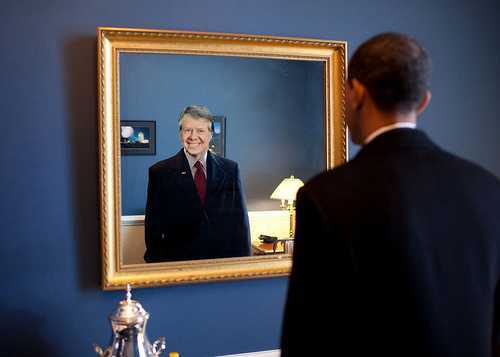 It has become obvious that Obama has become Jimmy Carter. The only way the economy in the late 70′s could get better was that Carter had to be replaced as president in the 1980 Presidential election and replaced he was in a landslide by Ronald Reagan. What does any good leader do when Rome the United States economy is falling around him, why Obama plays the fiddle of course. Actually he had a birthday barbecue. But before that he ran off to a fundraiser in Chicago. Priorities Mr. President, priorities. The question really needs to be asked, is Obama in over his head or is this intentional? In either case Barack Obama must go. Do your patriotic duty Mr. President and just resign. It is hard to believe that Obama can be reelected in 2012. If he is, it is the end of America.